Gospel fun for Christmas! 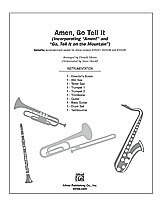 This energetic gospel-style arrangement by Donald Moore partners two traditional spirituals; Amen! and Go; Tell It on the Mountain. Highlights include blues harmonies; call-and-response; and a gospel ad lib vocal solo. The optional gospel instrumental accompaniment adds to the fun! Great for both school and church choirs; in three voicings for singers of all ages!